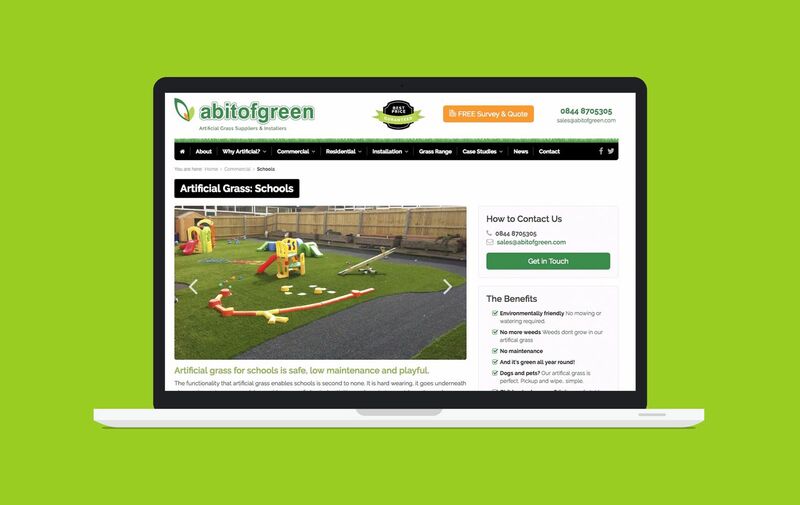 A Bit of Green, based in Northamptonshire, is an Artificial Grass Lawn Company focused on design, supply and installation of artificial lawns to both domestic and commercial customers. With a friendly family run company approach, their main aim is to offer all their customers fair prices and high quality products. Brave were asked to review, consult and strategise their website to put a plan in action which would increase leads and drive more enquiries. The new website needed to be mobile friendly and heavily promoted through all available digital opportunities with Brave closely tracking performance over time. Brave’s key objectives with this project were to review, strategise and totally understand why their existing website was not performing well plus own a few geographic google searches, one of which would be Northampton. Since they are based in Wellingborough, operationally this seemed like a no brainer. This followed by putting a plan together to build a robust, future-proof and suitable alternative, which better presented the company. This, in turn, would help generate quality leads. A Bit of Green is derived from its very namesake – fun and a little quirky. It represents these attributes as a brand, promising to keep things easy to understand and to the point. 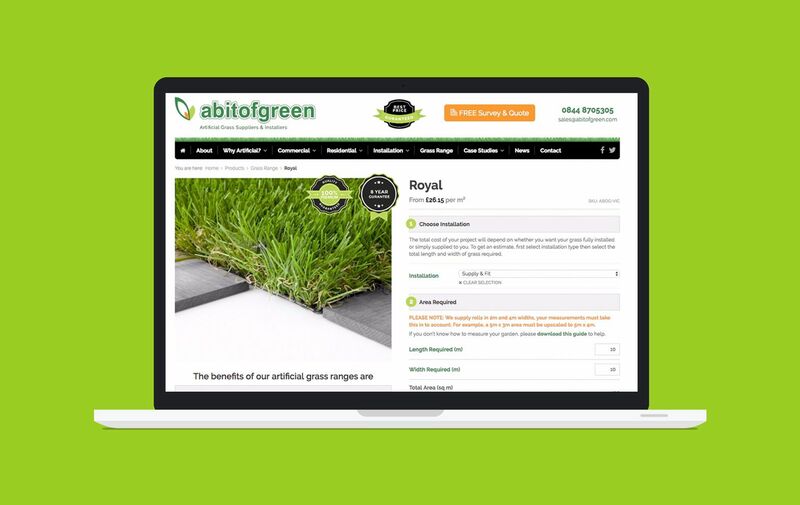 Their new website design needed to fully encompass what A Bit of Green wanted to communicate to its target audience, to the point and with no confusion to the product offering. We needed to project professionalism, credibility and experience in our design whilst at the same time offer instant quotes. These would quickly display the cost of installation, filtering out any leads which weren’t likely to convert. From a technical user experience (UX) perspective, they required something special from the new website, starting at product selection, through to the enquiry. Ask anyone in the industry, and they’ll tell you that WooCommerce is the world’s leading WordPress e-commerce plugin. It transforms standard WordPress brochure websites into a fully functioning online shop. We opted to use WooCommerce as the core plugin to provide A Bit of Green a fluid brochure feel, which enabled Brave to keep the door open should they wish to switch over to full e-commerce in the future. By being forward thinking and considering future business objectives, we were able to develop a step by step quotation process. 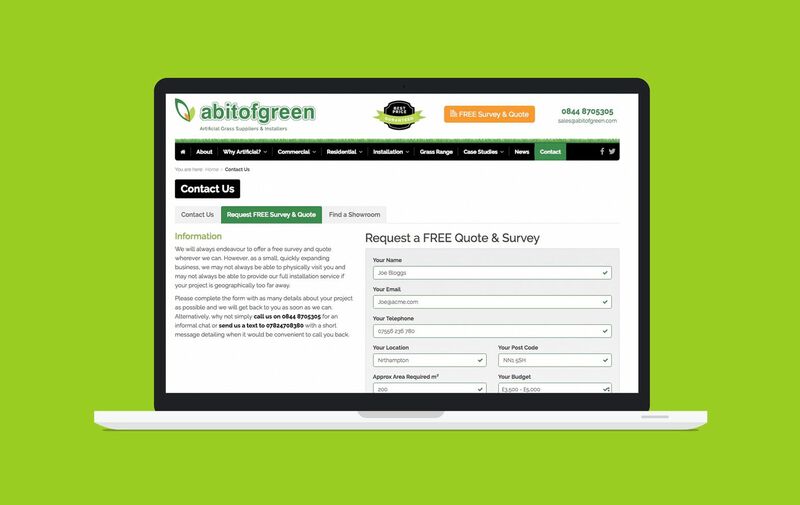 We developed the ability to store the quotation, feeding this directly into an enquiry form that then relayed on to the sales team to process. 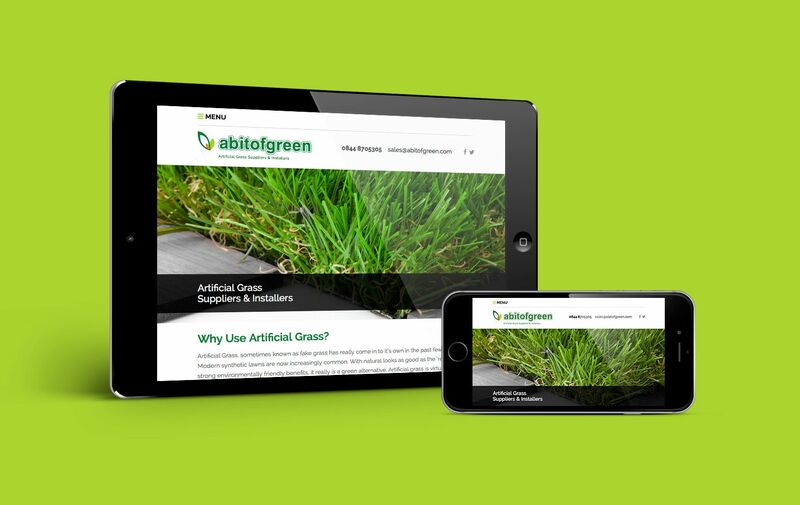 We focussed quite heavily on the mobile browsing experience and implemented a fully responsive design. Brave wireframed and iterated over a period of time, ultimately looking to capitalise on the UX and conversions for mobile users. When the site went live, even we were pleasantly surprised when we saw the results. Showing what we can do with well though out UX design, great code, and a fast loading website. Our in-house digital marketing team were key to the success here from the the initial SEO content strategy and website structure through to implementing a successful PPC campaign with a data-led approach that focuses on a strong ROI and customer acquisition. 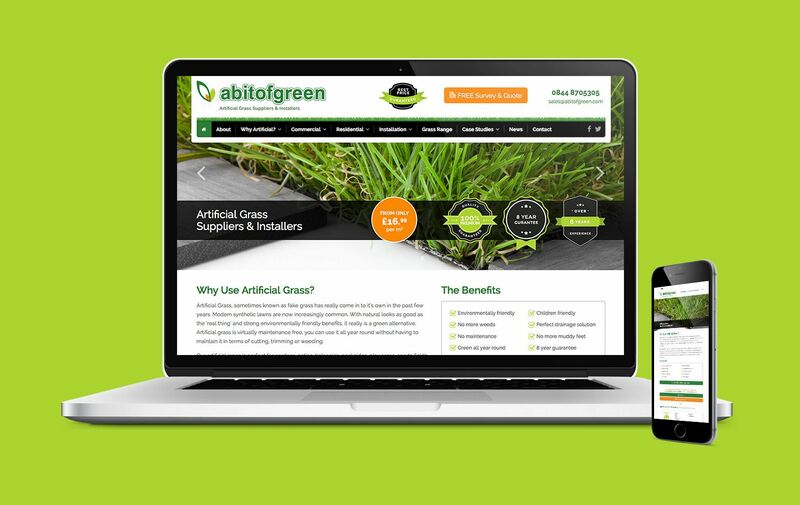 Search for “artificial grass Northampton” – they appear on page one and competing with some pretty big players in the industry – watch this space! 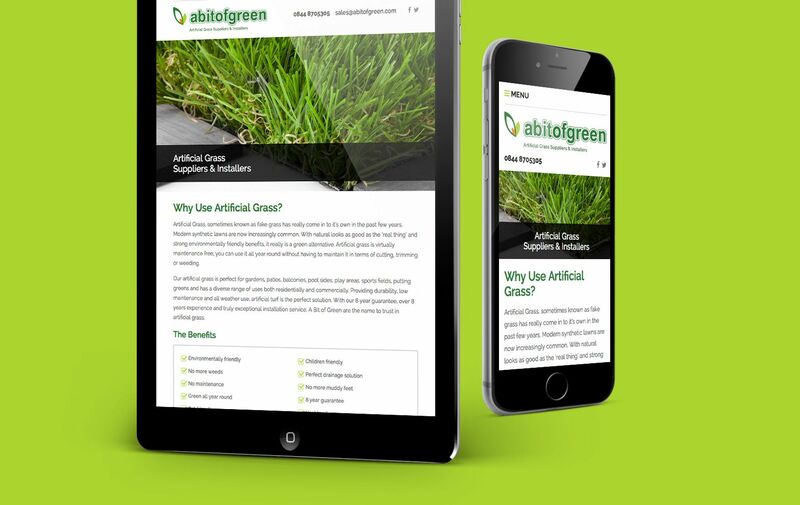 Following the completion of our work with A Bit of Green, conversion and enquiry rates increased and further progress was made to ensure that the user flow was easier for the consumer making their website a complete success. In the 12 months since the website first went live, they have reported a phenomenally successful year with record leads, visits and converted sales. The impact of our involvement on A Bit of Green’s business has been undeniably significant and impressive.